Customer Service Marketing High Five! 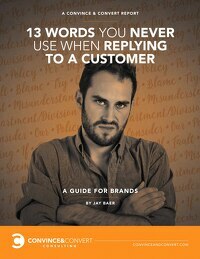 Thank you so much for downloading “13 Words You Never Use When Replying to a Customer”. It is more important than ever before to be mindful not just of what your company says to customers online, but HOW it is said as well. Minor shifts in word choice can mean the difference between a great customer interaction, and an unruly, offended mob. Let’s work together to exponentially improve your customer success. Take a look at how we help some of the largest companies in the world with their customer success strategy. If you think it makes sense to chat now, please let us know. We can’t wait to get to know you!